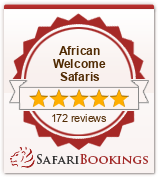 The Chobe National Park is located in the Northern part of Botswana and comprises an area of approximately 11 000 km². The park lies along the Chobe River, which borders Botswana and Namibia. The Chobe National Park is the second largest park in Botswana and is known for its superb game viewing all year round as it has one of the largest populations of game on the African continent. Chobe is probably most well known for its impressive herds of African Elephants. The Chobe River supports the largest concentration of elephant found anywhere in Africa and it is not uncommon to encounter herds in excess of a hundred. After your morning activity at Chobe Savanna Lodge you are transferred by boat to Chobe game Lodge – where you will be spending the following two nights. Picturesquely situated 100 km west of the Victoria Falls, overlooking the Chobe River and the Caprivi floodplains, the iconic Chobe Game Lodge is the only permanent safari lodge within the Chobe National Park. Enjoy your last early morning game activity followed by a heart breakfast. Check out and road transfer from Chobe Game Lodge to either Victoria Falls Airport, Livingstone Airport or Kasane for your onward travel plans.